'In-Contact' is an excellent bookings system and specialises in all things booking related. You can create your own courses and events and then quickly locate an available space when someone calls you or when taking bookings face to face. Enter a few details and the booking is complete. Confirmations can be printed, emailed or even sent using SMS! You can keep a full financial record for each contact and company so you know exactly who owes you what and why. Add a simple URL link to your website and you will be able to take bookings through your website too. As it's all connected to your bokings database there is no chance of overbooking any course. Your website can then take bookings for you even when the office is closed, and when linked to our PCI compliant card processor you can have the payment taken straight away. 'In-Contact' has all the features of a Customer Relationship Management package built in - A full contact history as well as all the address, phone number, contact details and payment history. Enter every detail your need for every contact and company you do business with. You can enter customers, private addresses and company details. Even if you don't find all the fields you want to enter information you can easily add your own fields. Once added they just become part of your system like any other field. All correspondence can also be recorded - details of letters sent or received, phone calls, e-mails and any other communication can be easily recorded and viewed. Diaries allow you to manage your events, courses, staff and resources. You can create new events and courses, and add them to your diaries. Using the 'recurring event' you can quickly set up events and courses to occur weekly or monthly. Staff and resources also have diaries, so at a glance you can see exacly what is going on. You can keep track of exactly who owes you money, how much has already been paid, and who you owe money to. Financial reports give you an accurate picture of income and expenses as well as debtors and creditors. Built in invoicing allows you to raise and track invoices, so there really is no need for a separate accounts package. This removes all the problems associated with exchanging information with other packages. However, in the event that you did need to do this, all the reports are exportable in csv, pdf and excel format. 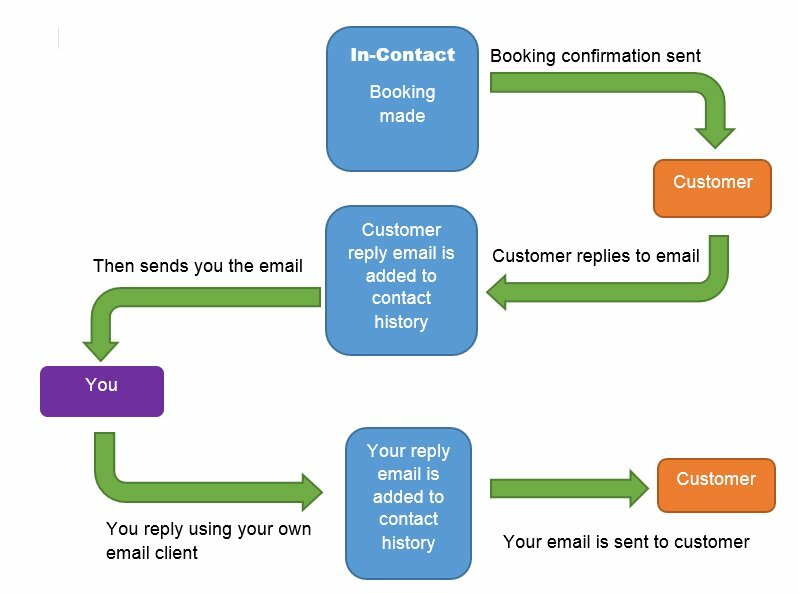 When you send a booking confirmation or letter through email it is automatically added to the contact history. If your customer replies then a copy of the reply is automatically added to the contact history as well. So, it makes it really easy to see all communication with a given customer. No need to seach outlook folders or name searches on email inboxes. You can still continue to use your favourite email client, all communication is automatically captured without you having to do anything extra. Never know where your staff are? The built in staff planner allows you to see at a glance what everyone is doing. You can book staff onto events and courses, enter staff sick time and holidays, and view a diary for each staff member. Each staff member can easily see what courses they are running. Selling gift vouchers is a very convenient way of generating extra income. With 'In-Contact' you can create and sell your own gift vouchers and the system will keep track of them all. If the gift voucher is for a special occasion it can be delivered on the date of the occaision. Vouchers can be redeemed using the online booking system meaning your staff have very little extra work to do administering vouchers. Financial reports : Income, expenses, invoices, banking, debtors, creditors, advertising, promotions. Course reports: Course vacancies, courses filled, pass rates, diary in text. Contact reports: Contacts input or updated, recent correspondence, contacts with no bookings, booking dates to be arranged. Staff reports: Staff contact details, staff activity. Each of these reports is customisable by filtering, sorting and grouping so you can get exactly the information you want. You can also export in PDF and Excel formats.. Need the income report every Friday morning? If you need reports generated at regular intervals you can add them to the scheduler. They will get generated at sepcific times and e-mailed to you in PDF or Excel format. You can also send the reports to other people to keep them informed. You can replace your 'contact us' or 'enquiry' page on your website with one that looks almost identical from our system. When an enquiry is made the details go straight into your database thereby avoiding all that re-keying of data. It also means you don't loose new enquiries as you are notified whenever a new enquiry is made. A good example of this is our own website on the 'contact us' page. The enquiry form is an 'In-Contact' enquiry form embedded in the page and will add the enquiry details straight into the database and send us a copy. 'In-Contact' CRM has a fully integrated credit and debit card processor, making it really easy to take card payments over the phone, in person or through your own website. We provide card processing through First Data (https://www.firstdata.com/en_gb/home.html). They offer a very competetive rate of 1.3% per credit card transaction, 0.5% per debit card transaction and a monthly fixed cost of £20. If you already have a credit card processor then we can use 'PayVector' to link into your existing merchant account. 'In-Contact' is fully PCI DSS compliant. Please click here for our compliance details. 'In-Contact' enables you to search your database of customers using a wide variety of criteria. Once selected you can send out emails to these selected groups of customers using whatever content you like. You can even track who opens your emails and who clicks on the links that you put into them. 'In-Contact' has built in SMS text messaging. You can send text messages to your customers, staff, or in fact any UK mobile number. All messages are fully audited so you can see what was sent as well. SMS can also be integrated with the booking confirmations - have the booking confirmation sent directly to the customers' mobile phone whilst they are on the phone to you! You can also have SMS reminders automatically sent to your customers a few days before the start of the course so that they don't forget. You can create 'call back' lists that act as reminders to call back potential customers who have expressed an interest in your courses. These lists are presented on the screen along with a summary of the last call and what was said. This allows your staff members to work their way down the list calling and updating the results as they go. Resources cover a whole set of items that you need in order to run your courses and events. For example, you may need a projector to run a training course, or a pool car to visit a customer. As these resources are often shared you will want to book them to make sure they are available, and to prevent double booking. By entering all your resources onto 'In-Contact' you can book them whenever you need them. It is then very easy to see what resources are being used and when, and if a resource is not available you can see who has booked it and for what. You can choose who can log in to your system and who can see what. For example, you can restrict who can get to the finances, or who can take a booking. You can also restrict who can view the reports on a 'per report' basis. All changes are audited, In-Contact keeps a note of who input a contact and when, and who was the last person to update a contact and when. There is no dispute as to who was responsible for changing something. Everything within 'In-Contact' can be changed by yourself to get it to work the way you want. All of the input screens can be modified, you can add fields, remove fields, and create fields of your own. You can create your own events and courses, change the confirmation letters, update prices, add and remove promotions and change anything else you need to.